Onlineability’s Andy Darley is to put aside the comforts of Christmas this year and dash into the chilly sea on behalf of a charity commemorating a young racing driver. While most people will spend Boxing Day with their feet up in front of the fire snacking on left-overs, he will be in Cromer, Norfolk, taking part in the town’s infamous Boxing Day Dip. The 45-year-old from Hitchin is hoping to raise £200 for the Henry Surtees Foundation, a charity set up following the 18-year-old’s death in a freak accident during a Formula 2 race in 2009. 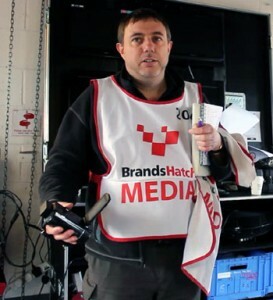 Andy, who teaches journalism in addition to his work in motorsport, said: “No-one involved in racing will ever forget the awful day Henry died. My students are mostly the age he was, and this motivates me even more to support the foundation. Andy can be sponsored at Virgin Money Giving. Fundraising will remain open until the end of January. Filed under Events and happenings, Things we've done and tagged with fundraising, Henry Surtees Foundation, motorsport, outdoor swimming.